The Diffraction Grating Spectrometer measures properties of light and view visible line and absorption spectra. This is a diffraction grating spectroscope for viewing visible line and absorption spectra. The spectrum is superimposed on a scale that gives the approximate wavelengths. A bright spectrum is produced by a diffraction grating replica with 6000 lines per cm. An adjustable diffusion mirror lets you use any convenient light source to illuminate the scale. The body of the spectroscope is a one-piece aluminum casting. Body parts are made of Bakelite. 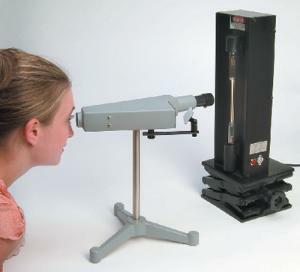 The spectroscope can easily be held in hand, or it can be mounted on the provided tripod support. The slit is adjustable. The spectroscop is 30.5 cm tall with its tripod.